"THIS is how you peel them!" Ms. L says, a little too loudly, to her co-students in Cooking Class, and completely takes over the task of peeling, deveining and butterflying the prawns. The other ladies leave her to it and wait for my next instruction. Ms. E looks up from her inconspicuous corner as I ask her to pound the spices into a paste. She is quiet and restrained in every movement, from chopping onions to using a mortar and pestle. We cheer her on like a last-place marathon runner dragging herself to the finish line...."pound, Ms. E, harder, c'mon, you're almost done!" Meanwhile, Ms. C takes notes on every tip, every secret I share while going through the recipes, and happily volunteers to sautee or deep-fry or stir. Cooking class can be frenetic! This week's lesson has simmered down quite a bit. 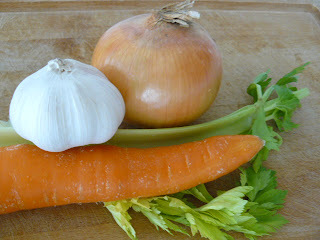 I'm sure Ms. E is relieved that the pace has mellowed as we learn how to make soothing and flavorful soups. In a large soup pot, heat 2 teaspoons of oil on medium-high heat. Sprinkle meat with salt and pepper, and brown on all sides, about 5 minutes total. Set aside. Add remaining oil to the pot. Sauté onion and mushrooms until softened, about 5 minutes. Add carrots, celery, garlic and cook for 5 minutes more. Add broth, tomatoes, meat, barley and thyme and bring to a boil. 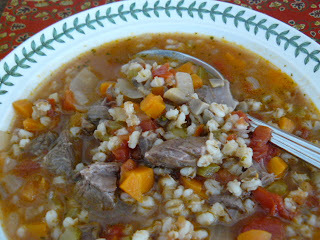 Reduce the heat to low, cover and simmer until the barley is cooked and meat is tender (about 50 minutes). Taste and season with salt and pepper. Ladle into soup bowls and garnish each serving with a sprinkling of parsley.